Be the first to share your favorite memory, photo or story of Nestor. This memorial page is dedicated for family, friends and future generations to celebrate the life of their loved one. Nestor Duran Garcia, 56, resident of Hollis, Oklahoma. He was born February 26th, 1962 in Guanajuato, Mexico to Felix Rico Garcia and Matilde (Duran) Garcia . At the age of fifteen he moved to United States. On June 21, 1983 he married Dora Esparsa in Hollis, Oklahoma. He worked as a Seasonal Worker, working on farms. He was a jack of all trades working to provide for his family. Nestor loved listening to spanish music, he was always listening to music. He enjoyed working on cars, by seeing the headlights he could tell you the make and model of the car. He had a special affinity for lincoln continental. Nestor loved his grandchildren they referred to him as " Popo" his grandchildren were his world. 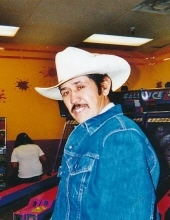 He is survived by his loving wife Dora Garcia, his father Felix Rico Garcia; Sons Felix Garcia and Ernesto Garcia; Daughter Melissa Saldana; Brothers , Jerman Garcia , Jose Garcia, Leo Garcia, Efrain Garcia; Sisters Sirenia Garcia and Guillermina Garcia; grandchildren Alexis L. Garcia, Mareli Saldana, Mariah Saldana, Pearla Garza, Keila Garza, Arriana M. Garcia and Jose M. Saldana. He was preceded in death by his mother Matilda Garcia, son Lionel Garcia. Visitation will be Wednesday December 5, 2018 from 11:00 a.m. to 8:00 p.m., the family will receive friends at the Harmon County Funeral Home from 6:00 p.m. to 8:00 p.m. Wednesday. A memorial service will be 10:00 a.m. Friday, December 7, 2018 at Harmon County Funeral Home. To send flowers or a remembrance gift to the family of Nestor Duran Garcia, please visit our Tribute Store. "Email Address" would like to share the life celebration of Nestor Duran Garcia. Click on the "link" to go to share a favorite memory or leave a condolence message for the family.